Another entry chronicling my adventures assembling and testing my Firestarter Boards. Part one can be found here. I was busy over the last week, so there was a larger gap between testing than I expected. Installed .1uF caps. .01uF caps, .68 uF caps, 470 pF caps and AD8237. Need more test points in future versions of board. 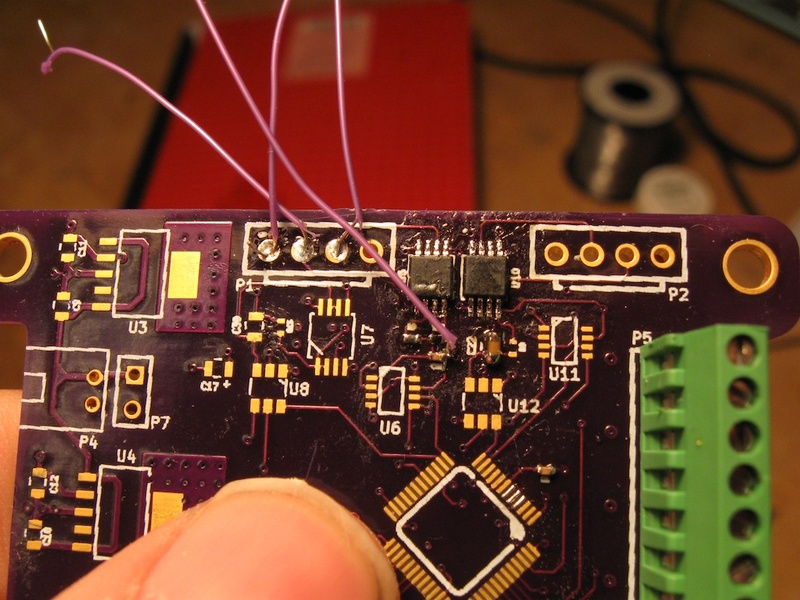 Current work around is to use some wire soldered to pads. It works for now. Tested AD8237 with 101x Gain preset. Used function generator and oscilloscope. I soldered down the E-Match fire electronics, which was easy. Everything seems in order, but I did not test anything. The most important part of this day as far as testing goes is I verified that the AD8237 is amplifying and working correctly. It works in a predictable way. 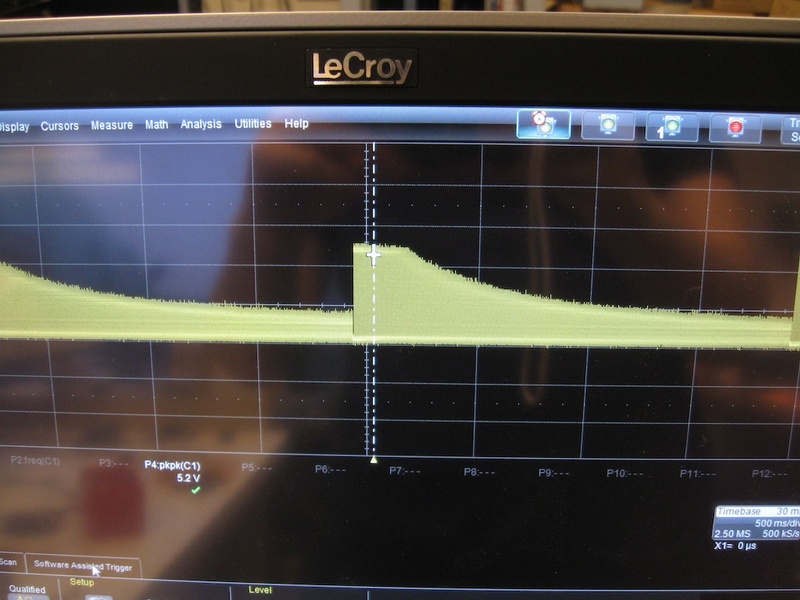 When I input a differential sine wave with amplitude 50mV, the result was a sine wave of about 5 V peak to peak. The amplifier seems to have a bandwidth somewhere close to 10kHz when running at 100x gain, luckily we will be operating at something closer to 10x. A test should be setup with the resistors setup for 10x. Also, the 10kHz bandwidth is consistent with the datasheet, since we are operating in high bandwidth mode we should expect a bandwidth of 10kHz for 100x gain. My setup for testing was rather simple. I used a lab voltage supply set to 5V, an arbitrary signal generator, and a Lecroy WavePro oscilloscope. I used a sine sweep from 1Hz to 40kHz to get the graph above with an offset of 9mV and an amplitude (peak-to-peak) of 50mV. I took a quick video, but it is not perfect and I ran into a few issues with the scope in the middle of it. Sorry for the shaking. Switch AD8237 gain to x10. Put in 4th order Butterworth filter (already tested individually) and test with AD8237. Solder down digital side. First get down Microcontroller and test JTAG interface.